Selling used cars is big business today and is quickly growing due to a rather troubled economy. Because the current economic conditions are so challenging for people, they simply prefer to buy a used vehicle over a new and more expensive vehicle. This trend has given way to a busy and ever changing used car market. Knowing these facts and knowing the best ways to sell your car online in a fast and efficient manner can help you to get the most for your car in the shortest amount of time. In this short but informative article, we show you how to quickly sell your used car online. Perhaps the most well known online resource for selling a used car is AutoTrader.com. This popular website has evolved from the old hard copy edition that we all grew up with years ago into a huge central online marketplace for buying and selling vehicles. Other comprehensive websites that offer similar services include Edmunds.com and Kelly Blue Book located online at KBB.com. These sites are steeped in detailed research information that helps buyers and sellers determine the fair value of a used as well as a new car. In addition, these sites provide well-written reviews and even videos that show a vehicle in action. Video tours of a used vehicle offer an outstanding way to provide potential buyers with an up-close and personal look at your vehicle. To quickly sell your used vehicle online always consider including an online video of your car. People can view the video at home on their computer or even on their smart phone and get a really good idea of what your car is like. If you don’t provide a video, then potential buyers may move on to the next ad that does have a video – passing you right by. Another useful strategy that can bolster your chances of having a successful sale is to provide buyers with a CARFAX data sheet available through CARFAX.com. This is a great way to show your potential buyers that your car has not been in an accident and that the title and other vital vehicle information is in order. If your car has been in an accident then still get the report. Knowing this and letting the buyer know about it shows that you’re not trying to hide anything. While getting this report may cost the seller of a used car a few dollars, it greatly increases the trust factor that is conveyed to potential buyers. Always try to set a fair and competitive price for your used vehicle to increase the likelihood that your car will sell quickly. The best way to zero in on the most accurate and competitive price for your used car is to simply use Edmunds or Kelly Blue Book. Both of these excellent online resources offer free used price calculators that take into account many variables regarding your car. These variables include accessories, overall condition, mileage and the year of the automobile. Another excellent resource that is completely free is Craig’s List. This highly traveled website can be used to supplement your paid postings on AutoTrader.com and Edmunds for example. Taking this approach to selling your used car can have you heading to the bank with cash or a check in hand as a result of a successful sale in little to no time at all. Selling online is a powerful and highly effective way to sell almost anything today. Taking advantage of this online medium means having a huge exposure that was previously not possible in the days prior to the Internet. The Internet is an obvious game changer in so many aspects of our life and when it comes to selling a used car this is equally true. 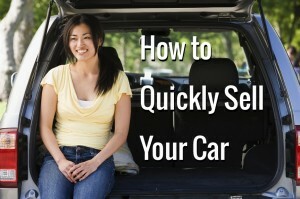 Knowing how to quickly sell your used car online simply means following these easy tips. It is also important to take good photos of your vehicle as a way to provide potential buyers with several outside and inside angles. Take photos in good lighting and at the proper distance to ensure that your ad gets noticed online. Take pictures of everything – the exterior, front seats, back seats, under the hood, the tires and the trunk. Other less known ways to sell a used vehicle online include working with a local car consignment business. These companies normally have an online presence that is extensive and typically viewed by a large number of people searching for a used car. With an accurate price in hand and a CARFAX report, selling a car quickly online should be fairly easy. To increase your chances of selling your car, consider posting to more than one website. Selling a used car is easier today than in the past and because the used car market is so incredibly hot, right now is the best time to sell your used car online. This entry was posted in Car Selling Tips and tagged Car Selling Tips, cash for my car, get quick cash for a car, how to quickly sell a car, how to sell a car, how to sell a used car, sell a car quickly by TC. Bookmark the permalink.